Developed by Bungie. Published by Activision. Released September 9, 2014. Available on PS4 (reviewed), Xbox One. Copy provided by publisher. It's somewhat ironic that Bungie makes a big deal about how "alive" Destiny is, because of all the games I've played recently, few feel quite so static and cold. Indeed, the overly hyped deal between Halo's creators and Activision has been home to all manner of pretentious attempts to call an orange a banana - it's not an MMO, it's a "shared-world shooter" in a "mythic science fiction" universe. Except it's not really those things. 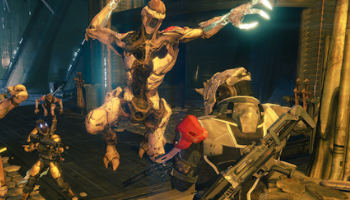 At its core, Destiny is an MMO, in a derivative science fiction universe. That said, it did keep its hooks into me for hours upon hours at a time, so it's certainly doing something right. What that something is, I'm not quite sure, because the vast majority of my experience with Destiny has felt more like a slog than a laugh. The story, as much as there is one, failed completely to draw me in, possibly because the tiny handful of distinguishable characters were really into the narrative but forgot to explain much of it to me. Like Charlie the Unicorn, I'm dragged around the story missions by inscrutable support players who are so engrossed in their grand adventure they don't care that I haven't been given a reason to care. As far as I can tell, something dark and scary is happening and also there are aliens who are bad guys and fight each other. The evil threatening the universe is called the darkness, because of course it is, while similarly outstandingly named enemies include the Fallen, the Hive, the Cabal, and the Vex. Yeah, not exactly the most original writing here. As a player in the "shared world" of Destiny, you're to step into the boots of a Guardian, living in the Tower, helped by the Ghost, and protected by the Traveler. Again ... not the most original of writing. The biggest crime committed by the story is the highly promoted role of Game of Thrones star Peter Dinklage. As the aforementioned Ghost, Dinklage's job is to vaguely relate the narrative to you, because actually showing any plot on screen is too much like real storytelling. He talks a lot, because Activision likes to get its money's worth, but what he says is rarely of consequence without the game doing any world building to back him up. What's truly criminal about all this is the distinct lack of personality Ghost has. Like a Star Wars prequel character, Ghost serves only to fill a role, rather than have any characterization or development. I want to criticize Dinklage's voice acting, as he sounds awkward and overly scripted throughout, but given what he has to work with, I'm not sure if it's fair. Bungie took one of the most charismatic actors on American television and turned him into a drab plot delivery monkey. So, the writing in Destiny is piss-poor, basically. It doesn't really go anywhere, most of it's explained in text collected in the background, and there are maybe four characters of note, none of whom I can remember the names of, or indeed care about. When the only villain of note is some nebulous concept called the Darkness, you're really struggling to give me impetus to press on. Fortunately, a decent job has been done to prop up the limp exposition with a drive for personal improvements. While I couldn't give a damn about Destiny's universe and its problems, I do care deeply about getting more guns and super powers, a desire Bungie fills quite adequately. If you're one of those gamers who care about such things as "content" and "replay value" to the exclusion of all other qualities, then you'll be suitably covered here. While it's drawn many comparisons to Borderlands, I personally don't see it, outside of the bullet-sponge enemies and loot-based gear system. It's got a far more traditional MMO core than anybody seems to be giving it credit for, with a structure almost identical to the massively multiplayer games that have spawned in droves since the popularity of World of Warcraft. From its hub world filled with faction heads, stores, and quest givers, to the way in which enemies stand rigidly at their posts and await the arrival of players, there is absolutely no denying (with a straight face) that Destiny is built exactly like an MMO. None of this "shared-world shooter" waffle. It is what it is - an attempt to weld Halo to WoW. In that effort, Bungie is largely successful. The game is structured like a big open-world RPG, but its combat will feel instantly familiar to anybody who played the studio's landmark Xbox-exclusive series. The guns and enemy behaviors look and feel like they'd be right at home in Master Chief's backyard, which is both a good and a bad thing. Good insofar as the general quality of the combat is rock-solid. Guns feel weighty, and it can be satisfying to chew through an enemy's resistant health bar and finally drop the sucker. Bad insofar as most of the enemies are an absolute chore to deal with. The various opposing factions have slight thematic differences, but behave in largely the same way. The bulk of their forces are made up of cowards who will run haphazardly around the field of battle, sometimes leading the player on a chase around large pillars or walls. These craven infantry are backed up by any number of foes that could count as "that one annoying enemy" in any other videogame, from the Stealth Vandals who invisibly charge and deal huge damage, to the insufferable number of snipers who can pop out of hiding and take you out of the fight before you even know what's happening. Then there are the big bastards who can one-shot even the hardiest veteran, and the less said about the Captains the better. Amusingly, however, the enemies get a lot more fun to deal with as the game progresses. The first faction, the Fallen, by far contain the most annoyingly jittery soldiers, hopping about randomly and backed up by snipers, armored robots, and other aggravations. The Hive, Vex, and Cabal are increasingly easy, featuring fewer annoying units and providing progressively easier targets. Coupled with the fact that, by the time you meet the Cabal, you'll likely have acquired some powerful weapons and skills, the dissonance between how much we're supposed to fear each new faction, and how pleasant they are to fight, is quite jarring.